In 2-quart saucepan, heat apples, butter, brown sugar, cinnamon and cornstarch to boiling over medium-high heat. Reduce heat; simmer about 5 minutes or until thickened and apples are tender. Set aside to cool slightly. Sprinkle work surface lightly with flour. Roll out thawed puff pastry into 15-inch square. Cut into 4 smaller squares. Brush each square with egg wash; spoon apple mixture onto center of each. Fold each in half diagonally to form a triangle; press edges together to seal. Use back of fork to crimp edges. Transfer to cookie sheet; brush with egg wash. Use sharp knife to cut a few vents into each turnover. Thaw puff pastry in the fridge overnight or at room temperature 30 minutes. To prevent filling from leaking, make sure to seal edges completely, and cut vents into each turnover before baking. 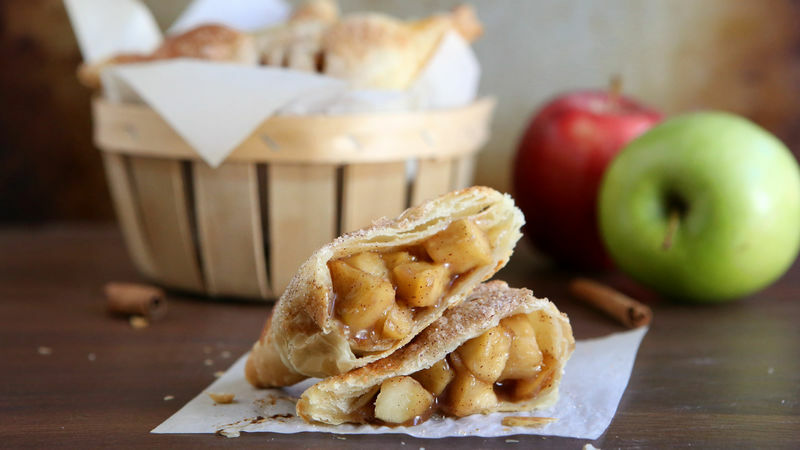 At first glance, apple turnovers can seem intimidating. But trust us, they aren’t really! These sweet and flaky pastries are similar to hand pies but with an airy, buttery crust that’s less dense. Puff pastry is the key to creating that perfectly light crust, which makes turnovers so scrumptious. Historically, puff pastry crusts are tedious to make, as this particular type of pastry gets its fragile crust from little air pockets that form between multiple, ultra-thin sheets of dough. So much rolling, so much layering and no smashing means making puff pastry is a delicate process, even for the most seasoned baker. Good news though, with this recipe we’ve taken the pain out of making puff pastry by using a frozen, pre-made version of the crust — it’s not cheating if everyone is doing it. But enough about the crust, the sweet filling is made using delectable apples and an array of fall spices. If these flavors speak to you, try out a few more of our apple recipes and learn all our secrets to baking with apples.